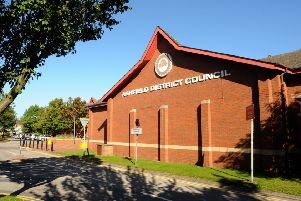 Yvette Marie Cutts, 30, of Westdale Road Mansfield admitted assaulting two females. A community order was made with a rehabilitation activity requirement of 15 days with £85 costs, victim surcharge of £85 and compensation of £50. Ricky Cyril William Marriott, 29, of Clumber Drive Mansfield admitted assaulting a male by beating him. Marriott who has a record of previous violence was committed to prison for 12 weeks, with £115 victim surcharge. He was bailed pending an appeal against his sentence. Mark Andrew Geary, 38, of Breck Bank New Ollerton pleaded guilty to assaulting a male by beating him and stealing 50p from him. He was committed to prison for six weeks suspended for 12 months and ordered to pay compensation of £100 with £70 victim surcharge. Andrew Pettitt, 39, of Teal Avenue Mansfield admitted assaulting a female by beating her. A community order was made with a 30 day rehabilitation activity requirement and a 60 hours unpaid work requirement within the next 12 months. A restraining order was made and £85 victim surcharge imposed with £85 costs. Callum Anthony Jackson, 36, of Gladstone Street Mansfield admitted stealing seven cans of deodorant worth £14 from Home Bargains. He also pleaded guilty to stealing meet pies and chocolates valued at £2 from Poundland and failing to surrender to custody at Mansfield Magistrates’ Court having been released on bail. A community order was made with a drug rehabilitation requirement. he was ordered to pay £40 compensation with £85 victim surcharge and £85 costs. Chelsea Jane Jones, 21, of Alcock Avenue Mansfield admitted stealing two wrist watches from TK Maxx and a selection of meats from Iceland. She also admitted stealing meat worth £18 from Marks and Spencers. A community order was made with a rehabilitation activity requirement for 15 days and an £85 victim surcharge. Donna Louise Abbott, 45, of North Street Sutton admitted stealing childrens’ clothing worth £138 from Matalan. She was discharged conditionally for six months with £20 victim surcharge and £200 costs. Jamie Michael Betts 39, of Jubilee Road Sutton admitted stealing razors to the value of £50 from Boots. He was discharged conditionally for 12 months with £20 victim surcharge and £85 costs. Carl Matthew Airey, 47, of Jubilee Road Sutton admitted stealing alcohol worth £54.50 and cider and crisps worth £5 from the Co-op. Offence committed during a suspended sentence order. He was committed to prison for a total of 26 weeks and ordered to pay compensation of £5. Daniel Robert Marshall, 28, of Pines Close Selston pleaded guilty to stealing an electric toothbrush and mouthwash worth £35 from B&M Bargains. He was committed to prison for six weeks suspended for 12 months, with £115 victim surcharge and £85 costs. Re-offending on post sentence supervision. Steven James Flynn, 41, of Hatton Court Mansfield admitted having a foil lined bag for use in connection with theft in a public place. He was committed to prison for eight weeks suspended for six months . offence was re offending on a court order. He was ordered to pay £115 victim surcharge and £85 costs. Daniel Michael Meason, 31, of Hardy Place, Mansfield admitted harassing a male by sending him threatening and abusive messages and throwing items into his garden, calling him names in a public place and on social media. A restraining order was made and he was discharged conditionally for 18 months. Orlene Rosemary Wallace, 56, of Thorney Court Mansfield was found guilty of harassing a female. A restraining order was made and she was fined £180 with £200 costs and victim surcharge of £30. Brian Ernest Holloway, 38, of Collins Avenue Sutton admitted driving while disqualified during a suspended sentence order. He also admitted possessing amphetamines. He was committed to prison for a total of 36 weeks with £115 victim surcharge. Craig Scott, 31, of Sanderling Way Forest Town admitted driving with 58 mcg of alcohol in 100ml of breath when the legal limit is 35 mcg. He was disqualified from driving for 12 months and fined £300 with £30 victim surcharge, with £85 costs. Jamie Damion Straw, 20, of Brown Avenue Mansfield Woodhouse admitted driving while disqualified. He was committed to prison for 12 weeks suspended for 12 months. The offence was during a community order. He was given a 200 hours unpaid work requirement and £115 victim surcharge and £310 costs. Dean Edward McClusky, 33, of Acorn View Kirkby admitted driving with 236 mg of alcohol per 100ml of blood, where the legal limit is 80 mg. A community order was made with a six month curfew order under electronic tagging. He was disqualified from driving for 25 months with £85 victim surcharge. Michael Merritt, 48, of Swanson Avenue Huthwaite admitted driving with 92mcg of alcohol in 100ml of breath. He was disqualified from driving for 36 months and ordered to participate in a drink impaired drivers programme with an 80 hours unpaid work requirement within the next 12 months. There was an £85 victim surcharge and £85 costs. Mark Anthiony Willmott, 40, of Brandreth Avenue Sutton, admitted possession of cannabis. He was fined £40 with £30 victim surcharge and £85 costs. Jonathan Walker, 24, of Commercial Gate Mansfield admitted using threatening behaviour. He was fined £100 with £30 victim surcharge and £85 costs. Shane David Thomas Blacklmore, 28, of Tideswell Court Mansfield admitted using threatening behaviour towards police officers and a female. He also admitted possession of heroin. He was committed to prison for ten weeks and ordered to pay £50 compensation with £65 victim surcharge. Kris Wright, 39, of Lime Street, Kirkby admitted using threatening behaviour. He was discharged conditionally for 12 months with £20 victim surcharge.